Discussions on "TRIZ and Lean (and others)"
Inspired by the paper "Lean-TRIZ instead of TRIZ-Lean" by C.M. Thurnes et al (Germany) , we in Japan recently have some active discussions among the readers of this site. In the Japanese page, email discussions among the seven persons are posted. I have translated my messges into English and posted them here. Sorry but I do not have time to translate them all (some of them are intensive). Mr. Takayama's Mind Map of "Pocket TRIZ for Six sigma" is originally written in English, fortunately. .
On reading this paper by C.M. Thurnes et al. (Germany), I would like to write down various thoughts in my mind. There are a lot for us to learn, for us to think, and for us to act. * I wish to learn the Toyota method (or the Lean Engineering) closely; to realize its historical significance in the world-wide scale, to understand and think over on it. * We in Japan also need to communicate, discuss, understand and cooperate among the people promoting different but relevant methodologies, such as the Toyoto methods, Creative design engineering by Professor Y. Hatamura and Professor M. Nakao (Univ. of Tokyo), Value Engineering (VE), TRIZ, etc. The TRIZ Study Group inside the Japanese VE Association Kansai Branch is the group most actively working for many (7 or so) years for such a purpose. In Tokyo area no active/continual groups seem to be organized so far. * I wish to learn about the historical and current situations of TRIZ acceptance in the automobile industries in Japan, and wish to reconsider our approaches with reference to this paper. The experiences and thoughts by the people who have been actually working in the automobile and relevant industries should be appreciated. * There seem to exist many people who know TRIZ (to some extent) but do not use it, in industries and academia in Japan. What are their real situations? Are they informed of modernized TRIZ instead of the TRIZ in late 1990s? Do they not use TRIZ because they think some other methods/philosophies better? * Supposedly, there are much more people in Japan who know TRIZ (to some extent) but are not able to use TRIZ. Thinking methods and thinking techniques are apt to stay at this stage ('knows but cannot use') for any person who only listen, read, and learn about them. It is necessary for the person to learn them with examples, to apply them for him/herself (or together with colleagues), and to get some good results in real cases. By using the thinking methods again and again, one can finally obtain some real experiences of success. Such a process and success experiences should be important for mastering TRIZ. * It is very important to make 'opportunities' where and when one can have real experiences and achieve some success. For making the opportunities, leaders should play the crucial roles; TRIZ leaders in Japan, leaders in each company, and leaders of individual projects. * Talking explicitly and publishing openly the success experiences are important next; in the projects, in the companies, in conferences, in Japan, and in the world; and in this "TRIZ Home Page in Japan" as well. * The present paper by C.M. Thurnes et al. is excellent not only in their practices and experiences but also in their reflection and discussions from the methodological perspectives. * In association to the "continual improvement" in the Toyota method, I remember the daily activity strategies for achieving goals described in "Techniques to Achieve Goals Absolutely" by Kenichi Nagaya (Chukei Publishing, 2013). Both of them advises to set up (big) goals and to perform small improvement activities continually in an adaptive manner, in the 'Real World' (according to my 'Six-Box Scheme' of Creative Problem Solving). Along the course, one happens to meet some big problems or to recognize some situations as 'necessary muda (waste)', and one needs to 'stop and think'. In such opportunities, one can be supported by some methods in the 'Thinking World'; and here we can expect that the methodologies for creative problem solving, including TRIZ, will play their real roles effectively. This is essentially the approach of 'Lean-TRIZ' described in the present paper by C.M. Thurnes et al. * I am just going to publish the Japanese Edition of "Hierarchical TRIZ Algorithms" by Larry Ball as the 3rd volume of the "TRIZ Practices and Benefits" Series. In the book Ball describes the whole process of new product development with TRIZ; starting with 'finding the market', proceeding to idealize (or think of the ideals of) the functions and systems, reaching to solve contradictions, and finalizing as new products in the market. In the whole process, the activities and thinking in the 'Real World' on one side and those in the 'Thinking World' on the other side should be separated and linked/combined smoothly. There are a lot to learn in this book as well. * I wish to thank again the authors of the present paper, Professor Christian M. Thurnes and Dr. Frank Zeihsel, for their excellent work which has triggered us to think widely and to practice effectively. -- Intensive discussions on Nakagawa's Editorial Note. Need to define the target area of discussions. 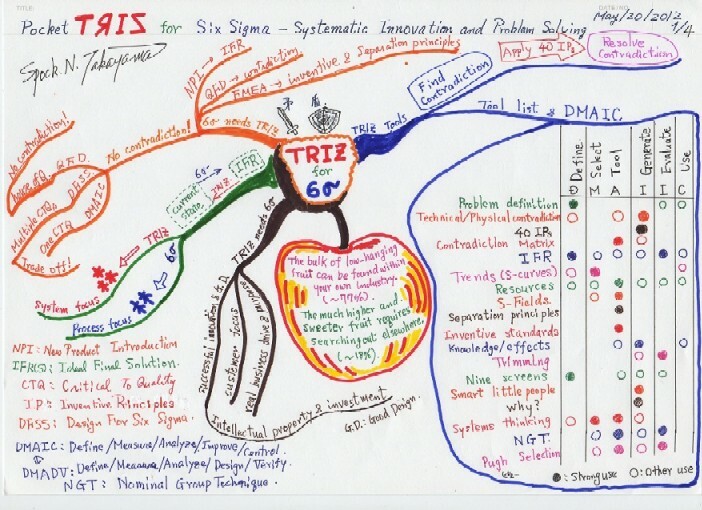 I have drawn a Mind Map of "Pocket TRIZ for Six Sigma". 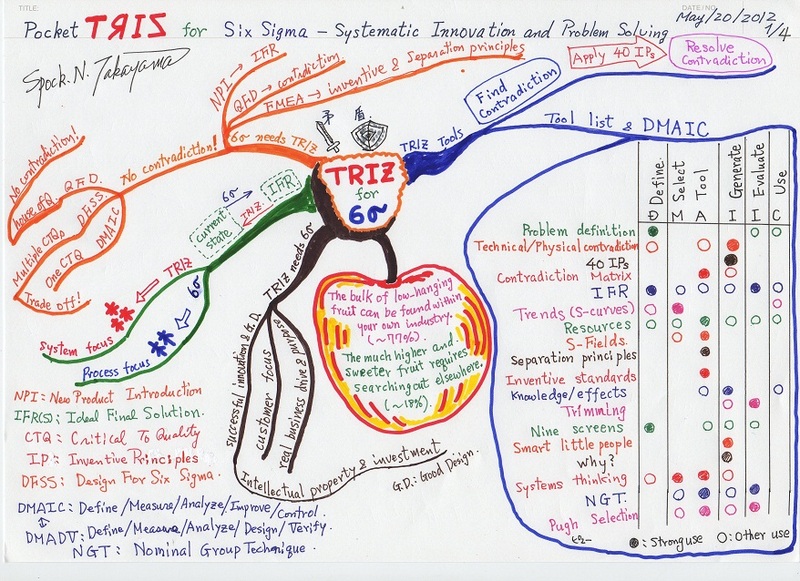 The figure shows that Six Sigma and TRIZ can support each other. I wish to see a similar map and complementary relationships between TRIZ and Lean. Thank you very much for your communications on the topic related to the 'Lean and TRIZ' paper. I am now preparing for posting them in a special discussion page of my site. I am much impressed and pleased to find that all of you are discussing on the topic from different aspects based on your experiences and knowledge in various methodologies as well as TRIZ and in product developments and marketing, etc. Such discusions are useful and illustative for many people, I believe. Mr. Uchiyamada was the chief engineer of the special project which successfully developed the world-first commercial Hybrid Car PRIUS. Mr. Uchiyamada was assigned in Jan. 1994 as the chief engineer of the project, which was specially established "To develop a Car for the 21st Century" by the Toyota's top management. Discussions in the project had concluded to set up the target as "Fuel-efficient vehicle for eco-society without disgrading the current confort". The fuel efficiency was expected to be improved by factor 1.2 with various improvements of the current technologies, and was set to be "factor 1.5 improvement" as the target proposal. However, the top management denied the proposal and ordered to meet the factor 2.0 improvement. At this stage for the first time, the project realized the need to introduce some drastic change in the power train and decided to choose the Hybrid System. At that time about 80 references and patents were known already. The project team examined them all closely and chose one scheme among them. - A special project by the selected team members of different specialities. - There are many technological issues to be developed newly. - Thus the project viewed and planned the general structure of the technology necessary in the new vehicle and decided to develop many new technologies in parallel (with reference to the Apolo Project in mind). --- cf. Usually, after succeeding in the development of preceding technologies, the post technologies (which uses the preceeding ones) are developed. - The risks in the development were unusually high, since quite new/not-well-known technologies are introduced,. --- cf. Usually, some alternative ideas/designs are worked in parallel for the purpose for preventing from the risk of failures. - Engineers of production technology devisions joined the team starting at the design stage. - For Hybrid vehicles, the system of electrical control is crucial. --- Mr. Uchiyamada, originally a mechanical engineer, had a carreer of working in a software division for 4 years just after entering Toyota. This experience helped him a lot to understand the Hybrid control system, he says. In late 1997, PRIUS was successfully started to sell in the market. And now in 2014, the accumulative sales is over 6 million cars in the world, as you know!! As presented above by the chief enginer at that time, the development methods employed in the PRIUS project were quite different from ordinary Toyota's way (and much more different form the Lean engineering). They are rather close to the "Hierarchical TRIZ Algorithms" described by Larry Ball; namely, consider the market needs first, and proceed to idealize basic mechanism and functions. As discussed by you readers, "we should first think what we need/want to do and then we should choose appropriate methods and tools suitable for the job". Thus, I recognize, the saying that "In automobile industries, Toyota production system (or Lean engineering) is suitable" is stereotypical (and including some misunderstanding).